This week I’ll let you see another outtake from my mysterious project, and discuss the habit I’m developing of adorning my camera bags with patches. I’ve put patches on my bags before — I showed off a leather patch from Steamcrow earlier this year, which I got at Denver Comic Con and stuck on my little Domke F5X-B. I’ve got a few other patches now in various places, including a Pentax Cosmicar patch on my big Domke F-1X (I know, the Cosmicar line was TV camera lenses, but it sounded vaguely Russian and the patch was super cheap). 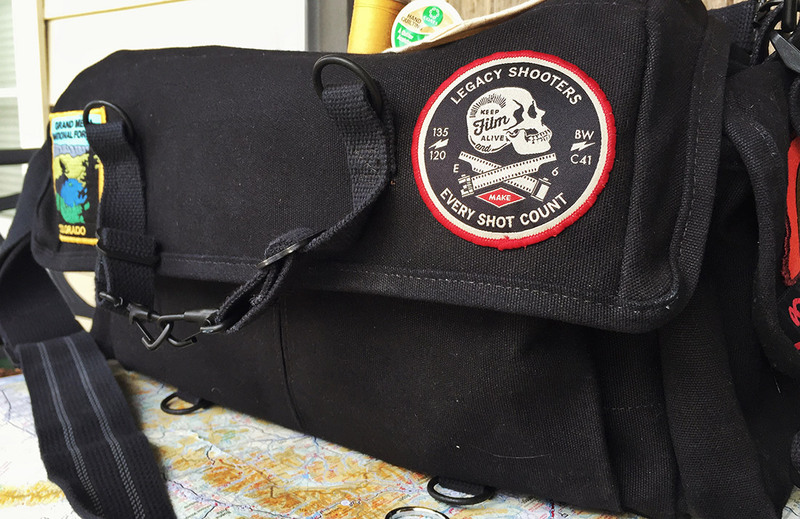 The latest addition to this collection is the Legacy Shooters Patch from Tap & Dye. I spotted an @TAPandDYE tweet with a picture of the patch sewn onto a smaller Domke bag and decided I had to make it mine. At first glance, $10 seemed steep for a patch — but then again, everything seems expensive to me these days. I didn’t mind, though, since I’d be supporting a small business. And you get a lot more than the patch for your money. I pre-ordered, so I had to wait awhile, but when the patch arrived I was impressed. It came in a fancy padded envelope made of recycled materials and with a spiffy Tap & Dye stamp on the front, looking very “vintage official.” Inside, the patch was wrapped in a linen pouch bearing the same stamp and cotton drawstrings. I’m not sure what I’ll use the pouch for, but I plan to keep it around because it’s just such a cool touch. The patch itself is very nicely made. It’s not fully embroidered — the black is a base material of stiff, plastic-backed cloth and the red and silver parts of the design are very nicely embroidered. Overall this leaves it thinner than fully-embroidered patches, but I think it looks plenty durable and the design is more finely detailed than you see in most fully-embroidered patches. A large skull features crossed 35mm film leaders drawn out of their cassettes in place of the usual bones, and the red diamond highlighting the word “make” calls to mind a number of classic logo designs including Diamond Foods, Orkin and Dow Chemical. The slogan reads, “Keep film alive and make every shot count.” To the left is “135/120” (135 being the original Kodak designation for 35mm film in casettes — the same stock, but with perforations more like 126 film, was used for 828 film). To the right is “BW/C41,” the two most common developing methods. The third process, E-6 (for color reversal film — slides), is sneakily split across either side of the crossed film rolls. So the markings on the patch sort of exclude large format and sub-miniature photographers. But I can’t imagine there are many film photographers who don’t use at least one of those things, at least some of the time. Overall, the thing is a masterpiece. Within hours of getting it I found it a place on the recently-acquired Domke F-1X I discussed last time. Up top you can also see the far end of the flap is adorned by a patch from Grand Mesa National Forest in western Colorado. 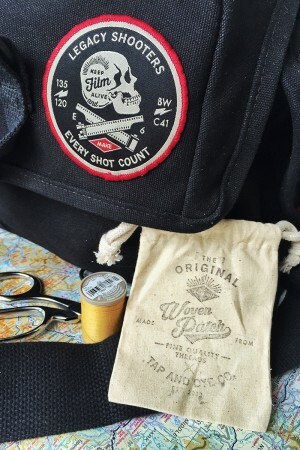 Before I move on, it’s worth noting that there are some great patches (and stickers) available from @MikePadua‘s Shoot Film Co., although the “In Grain We Trust” design I like best was sold out before I managed to order one. Asilda Store also has some neat patches and pins with film and travel themes. Here is another outtake from the work I’ve been doing in Eastern Colorado. I don’t think it’s likely to be included in my final edit for the project, but another photo taken just a few yards away might be. I took this photo in Kit Carson County with the Pentax 6×7 and 75mm f/4.5 Super-Multi-Coated Takumar lens. As with the rest of the project, I used Ilford Pan F Plus ASA 50 film and developed it in Kodak HC-110 at 1+63, with Kodak Indicator Stop Bath and Ilford Rapid Fixer. 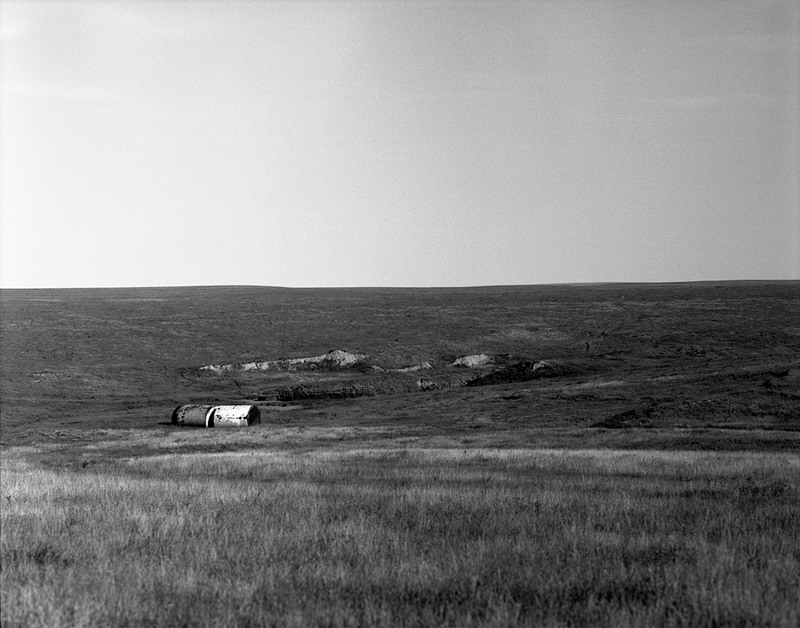 These abandoned condensate tanks lay on their sides in a low spot among thousands of acres of rangeland on Colorado’s eastern plains. While the Western Slope was much more severely impacted by the state’s oil busts in the 1980s, wells have dotted the plains since long before the current petroleum boom and the surge in hydraulic fracturing. This was one of the first days I worked in earnest on this project, and its direction wasn’t really solidified for me quite yet. I didn’t want it to wind up being just another pile of pictures of abandoned things, collapsing silently. I wanted to be sure we told a story. I think we’re getting there, though. Obviously, I’ll have more news as the release date nears.